The California Coastal Rose Society (CCRS) is a local non-profit organization affiliated with the American Rose Society (ARS) that serves the needs of North San Diego County rose lovers and gardeners. We meet at least quarterly at various locations and our primary focus is to promote knowledge on the growing of roses. We hope you will come join us so we can share with you our knowledge and enthusiasm as we launch into this exciting project. The California Coastal Rose Society was founded January, 1988. We are a nonprofit educational organization serving the needs of rose gardeners in our community. Many of our members are American Rose Society Consulting Rosarians and are happy to help you with your rose growing needs. You are invited to join us by clicking: Join CCRS. Our web site is here to provide a balanced array of education, photographs, rose resources and up to the minute information about events/meetings at CCRS. We invite you to sign our guest book. Please enjoy our beautiful roses. 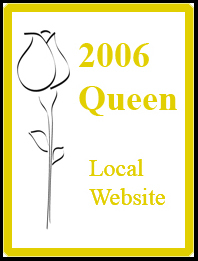 Our site was launched on December 30, 2005. 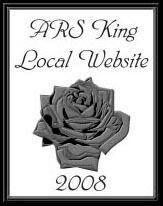 We are pleased to announce CCRS won the prestigious 2006 QUEEN of Local Web Sites Award from the American Rose Society, the #1 local society web site in the U.S. of the year and the 2008 KING (2nd place) of Local Web Sites Award.